See the girl. Leah Wilde is twenty-four, a runaway on a black motorbike, hunting for answers while changing her identity with each new Central European town. See the man, having come of age in extraordinary suffering and tragedy in nineteenth-century Budapest; witness to horror, to love, to death, and the wrath of a true monster. Izsák still lives in the present day, impossibly middle-aged. He's driven not only to hunt this immortal evil but to find his daughter, stolen from an Arctic cabin and grown into the thing Izsák has sworn to kill. See the monster, a beautiful, seemingly young woman who stalks the American West, seeking the young and the strong to feed upon, desperate to return to Europe where her coven calls. 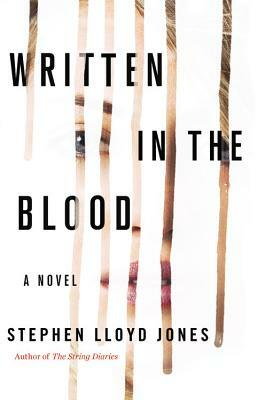 Written in the Blood is the epic thriller of the year, a blazing and dexterous saga spanning generations, and threading the lives of five individuals driven by love, by sacrifice, by hunger and by fear. They seek to save a race--or to extinguish it forever. Stephen Lloyd Jones studied at Royal Holloway College, University of London and now lives in Surrey with his wife, three young sons, and far too many books. He is the author of The String Diaries. "Terrifying, and deliciously so . . . A sophisticated horror story that induces elemental terror. It's perfect for the beach, particularly since you don't want to be alone with it in the dark."